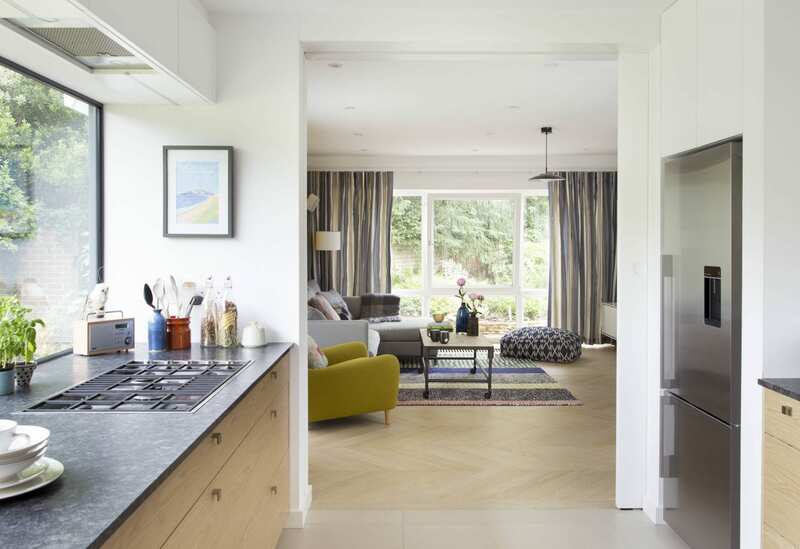 We were appointed to re-design a dated family house in Oxfordshire, introducing a brand-new layout. 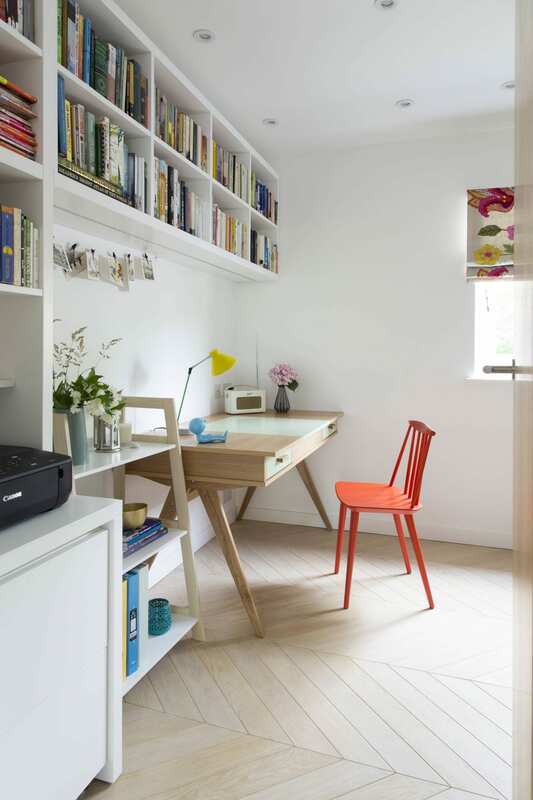 Our clients were keen to achieve a bright, open plan space, encouraging casual movement throughout. 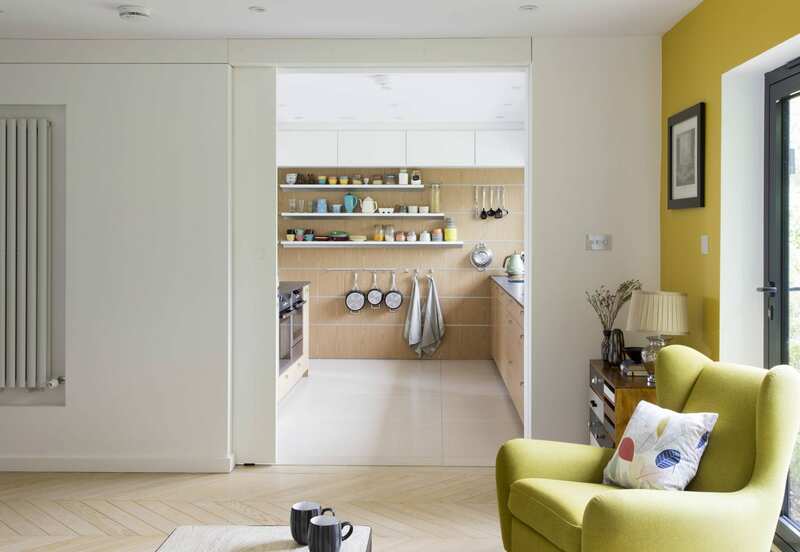 This house was totally transformed from a dark, dated space with a layout that didn’t work, and rooms with no through access, to a space that now encourages easy movement from one room to another. We created a new opening in the wall for direct access between the kitchen and living room, and installed a sliding door for flexible use. Once in the living space, you benefit from open plan access to and from the kitchen with the flexibility of closing the sliding door to form a single functioning room. 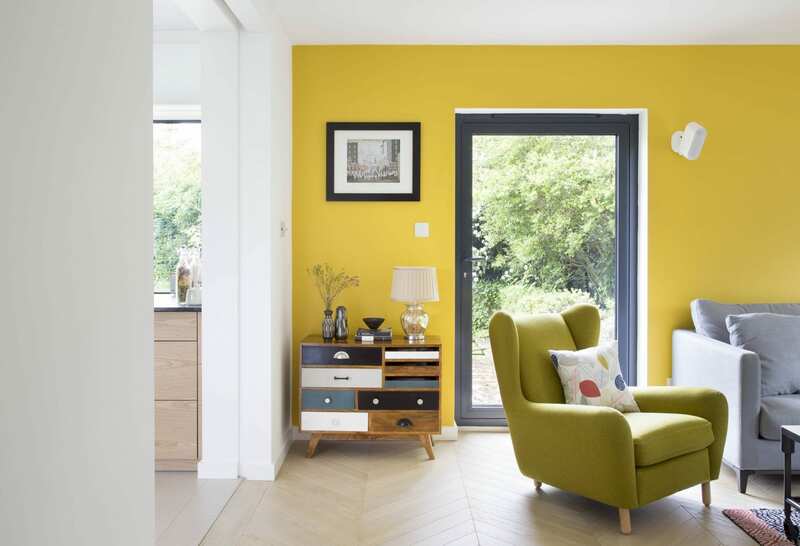 A bright and bold yellow feature wall helps add rhythm to be the living space and works perfectly with the gorgeous mix of mid-century modern furniture and contemporary bespoke wall units. 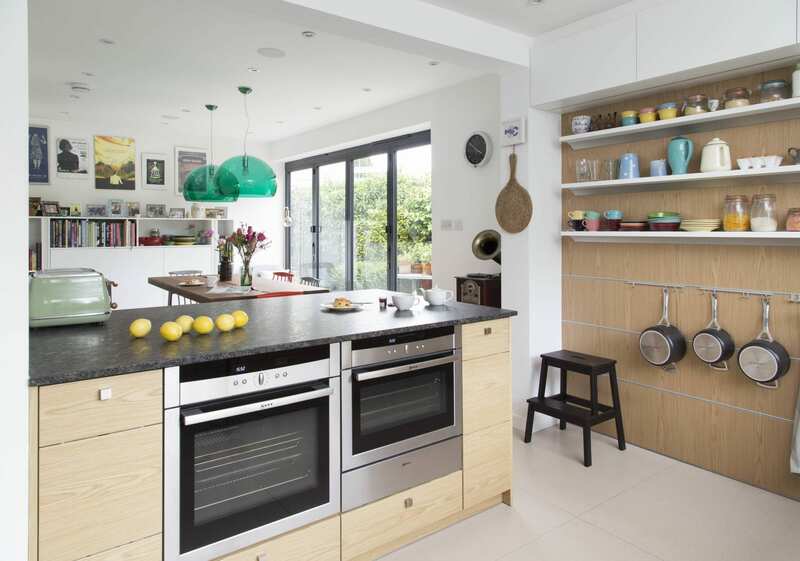 Key features such as the bespoke kitchen island complete with an integrated oven and microwave together with open shelving, provides extra storage for the dining room. 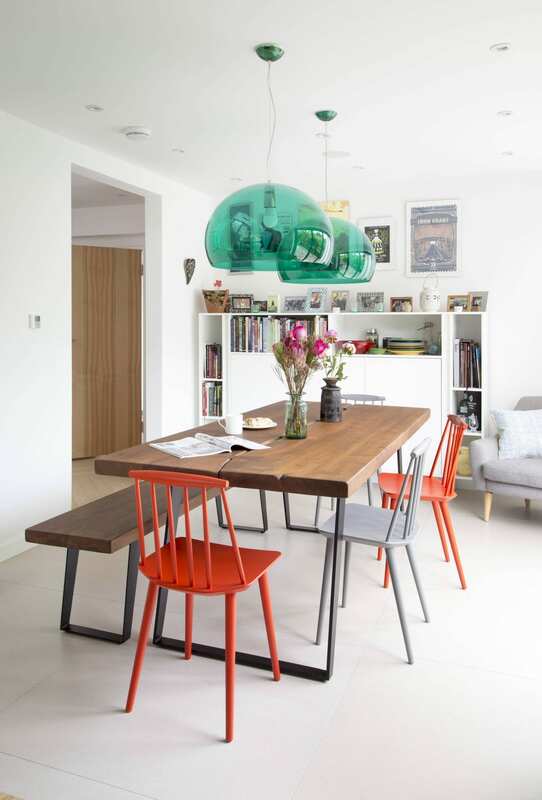 Pops of colour forms a coherent look between the kitchen and dining room. 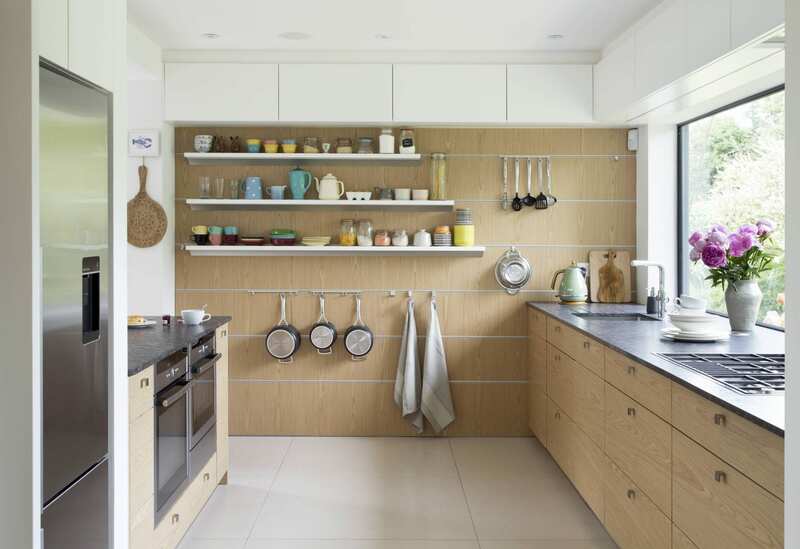 This kitchen space allows for easy movement from one room to another. The dining room leads directly onto the kitchen. 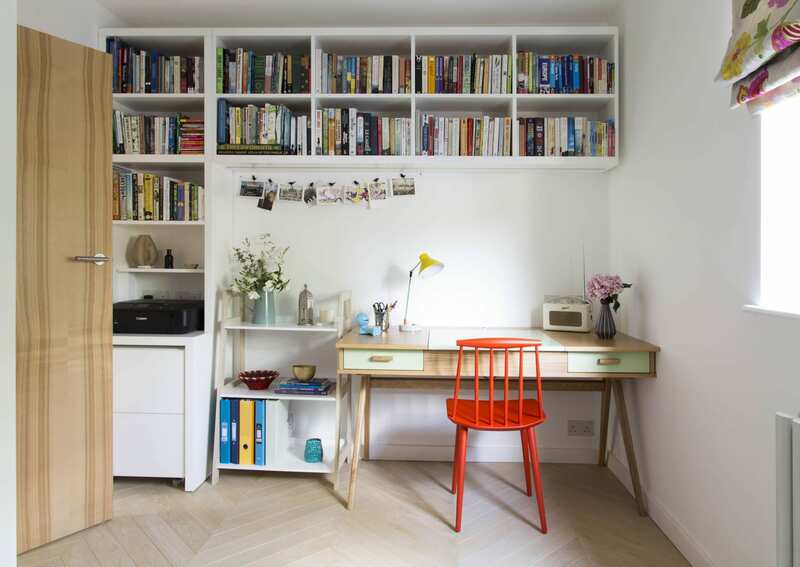 This bright space benefits from a bespoke white lacquer finish storage unit. 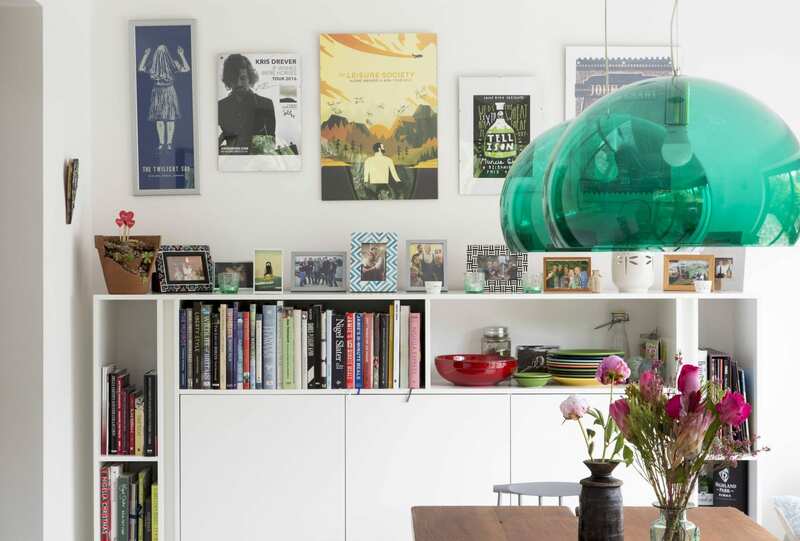 Pops of colour from the client's books, personal framed pictures and kitchenware all add personality. The living room layout encourages encourages easy movement from one room to another. 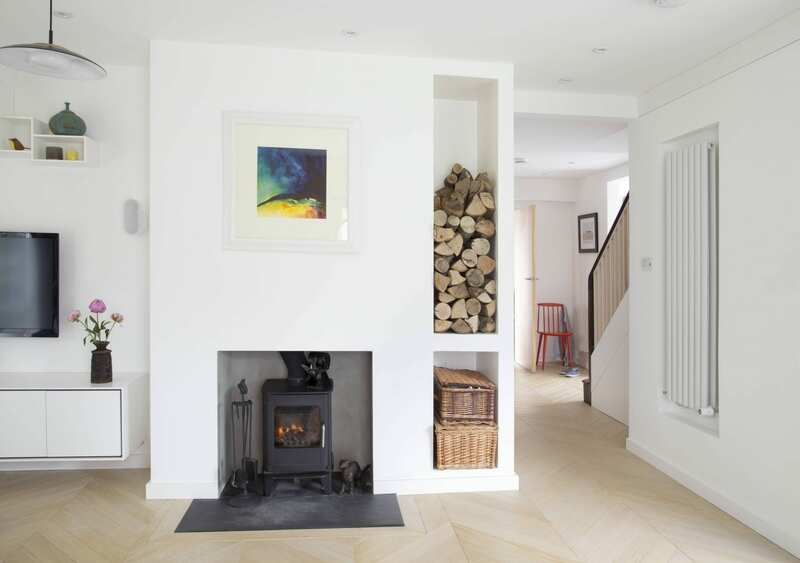 The wood and fireplace adds warmth to the white wash space to give it a comfortable and laid-back ambiance. 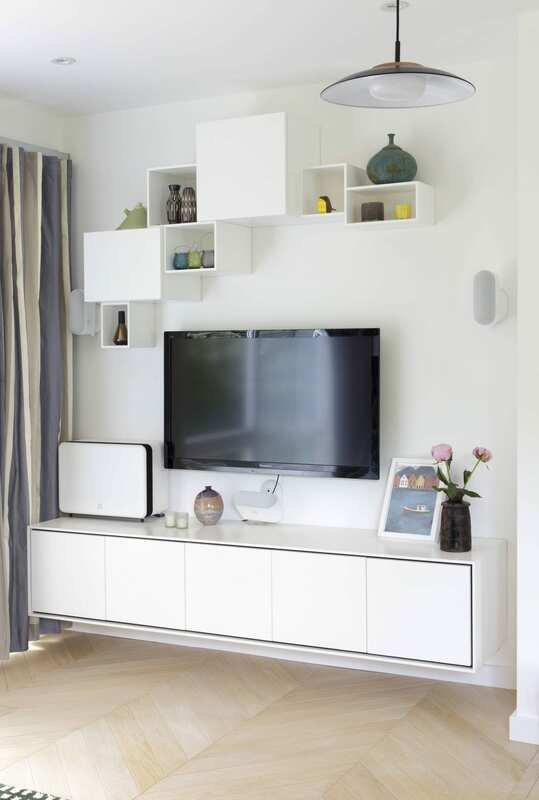 Wall mounted bespoke units designed and produced by Amberth keep all media devices discretely tucked away, for a smart, minimal look. The open shelving, distinctly arranged above the wall mounted shelving, adds a personal touch with the client's accessories. 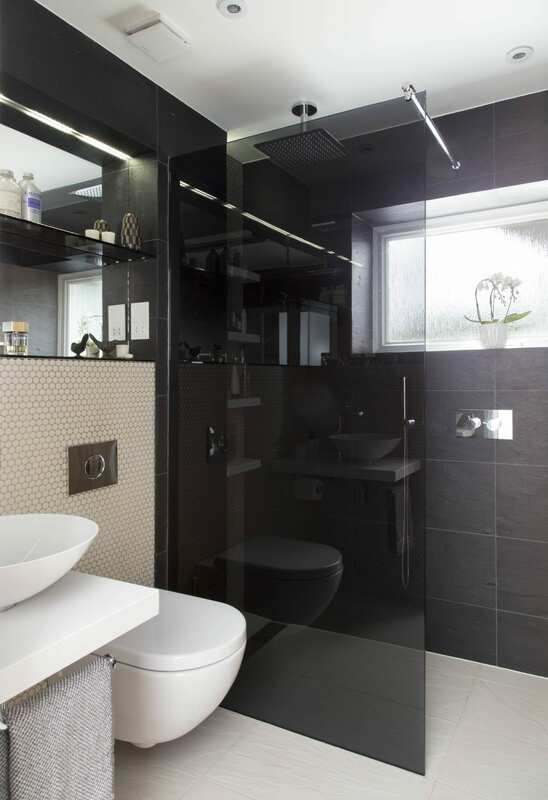 From a dull toilet to a modern, stylish space made to look and feel bigger with the use of glass, mirrors and natural light. A 50mm composite stone worktop with a deck mounted basin, lends itself as a space saving towel rail and toiler roll holder attached underneath. 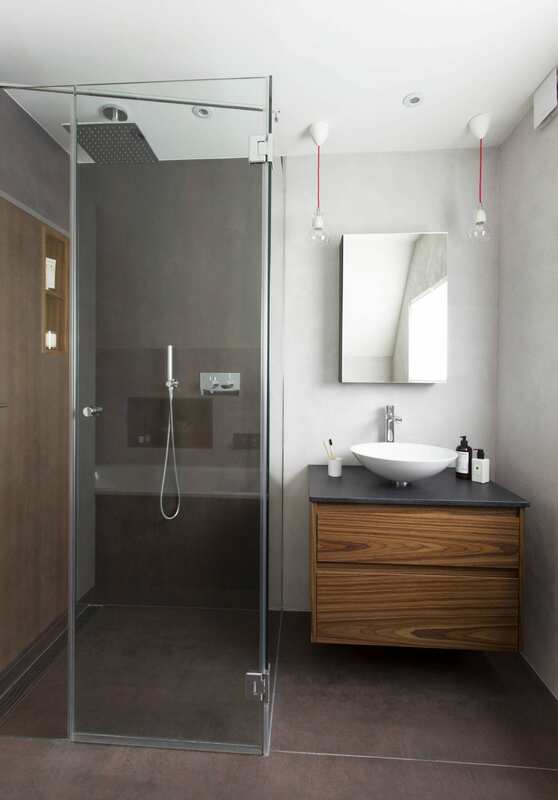 A tinted glass shower screen and generously sized mirrors, with glass shelves, visually expands the space. 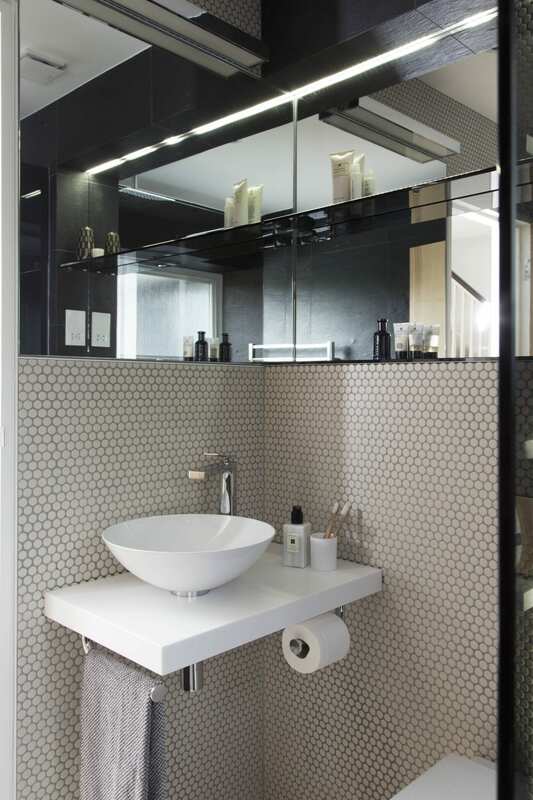 Porcelain floor tiles are offset by dark grey porcelain wall tiles for a contemporary look. The office has bespoke book shelves running across the entire length of one wall providing great storage for our clients. 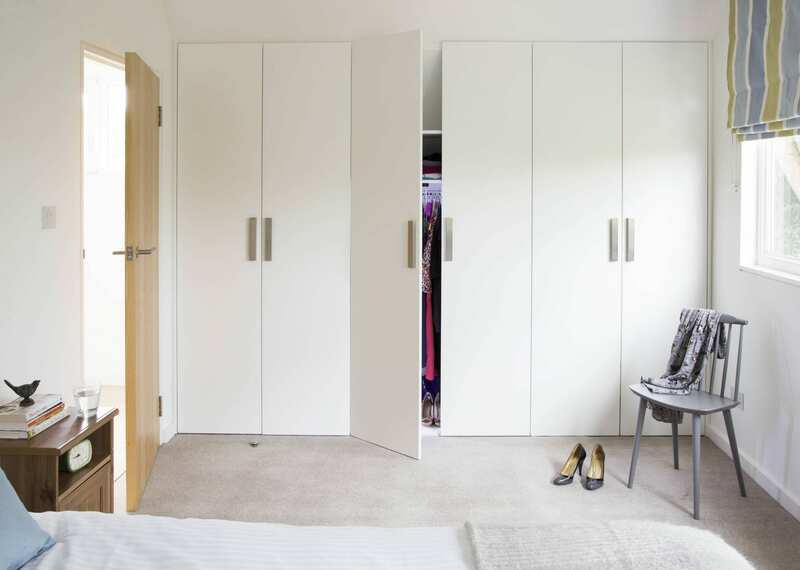 Bespoke wardrobe achieves a seamless, coherent feel, for a minimal look. Having bespoke and made to measure furniture are crucial when it comes to maximizing wardrobe space under the eaves of the roof. The upstairs bathroom benefits form a bath and separate walk-in shower. Bespoke vanity unit, a mirrored wall mounted cabinet with two ceiling mounted pendant lights and red wires for a touch of colour, gently bounces off the industrial tiled walls.